The Euro 3800 is designed for passionate wine connoisseurs with sizeable wine collections, featuring hand-carved accents and storage capacity for 458 bottles. 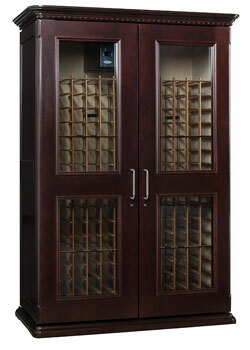 The Euro 3800 is designed for passionate wine connoisseurs who want to showcase their sizeable wine collections. Each wine cabinet is appointed with architectural details including hardwood doors and French windows, crown and base molding, and hand woodcarving. Engineered to create optimal storage conditions for protecting and preserving fine wine collections, the Euro 3800 provides digital temperature control and optimal humidity levels while offering advanced protection from harmful UV rays and vibration inside the wine cabinet. Every wine cabinet from Le Cache features all-wood Interlock racking that will accommodate large-format bottles, such as Burgundy, Pinot Noir and many Champagne bottles. Choice of premium wood and hand-stained finishes is included. 408 racked bottle capacity, 50 bulk bottle capacity, 5.5 cubic feet of bulk storage. Le Cache racks are built to handle almost every size of individual bottle including Champagne bottles. Whereas standard racking typically measures 3-1/4 inches wide, Le Cache racking measures 3-3/4 inches wide throughout the cabinet. All Le Cache cabinets are constructed from premium cherry wood, including solid cherry wood doors. Le Cache offers a choice of three hand-stained finishes - Provincial, Classic or Chocolate - each created to highlight the beautiful grains of natural cherry wood. After staining, a clear-coat sealant is applied by hand - twice - to protect and enrich the wood finish. 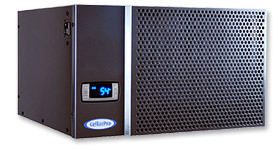 Le Cache cabinets have been reengineered with SB/0 Technology so that, together with CellarPro's top-vent cooling system, the back of the cabinets can be placed right up against the wall. Unlike the Contemporary and Storage Series wine cabinets, which require 18 inches of clearance above the wine cabinet, the upright European Country Series wine cabinets require just 13 inches of clearance above the cabinet (the reason is that the additional height of the European Country series wine cabinets is due to molding, so additional clearance is not necessary). Le Cache European Country series wine cabinets are shipped with the Crown and Base molding in a separate box. Other than the moldings, the European Country wine cabinets have exactly the same dimensions as the Contemporary Series wine cabinets. (The height and width dimensions increase only after the moldings are added to the cabinet.) Therefore, when maneuvering the cabinet inside the house, you should use the (smaller) dimensions of the Contemporary Series cabinets to estimate whether the European Country Series cabinets will be able to reach its intended destination. In all Le Cache upright wine cabinets, the heat generated by the CellarPro cooling unit is ventilated through the top of the wine cabinet. Consequently, there must be sufficient clearance above the cabinet for the hot air to dissipate. 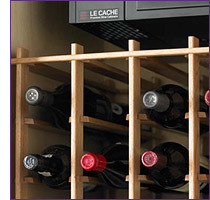 For European Country Series wine cabinets, you'll need 13 inches of clearance above the cabinet. See the table below for minimum ceiling heights. With the proper overhead clearance, the wine cabinet can be placed flush against the wall behind it.